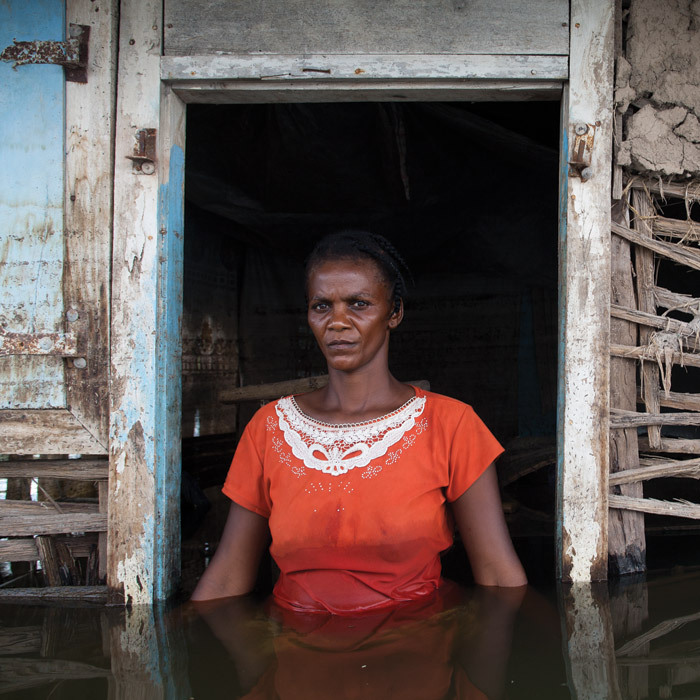 Flooding is now a fact of life for millions of people around the globe, in ways that 10 or 20 years ago were unthinkable. And it’s only going to get worse: in 2016, a British aid charity warned that by 2060 more than a billion people worldwide will live in cities at risk of catastrophic flooding, as a result of climate change. The US, China and India are among the countries most threatened, according to the Christian Aid report — for the US, hurricanes Katrina (2005) and Sandy (2012) bear witness to that fact — but coastal towns and cities everywhere, as well as inland port cities, are extremely vulnerable. If there is more consensus about the scale, pattern and predictability of flooding threats, there is also greater variety in methodologies for dealing with the threats. 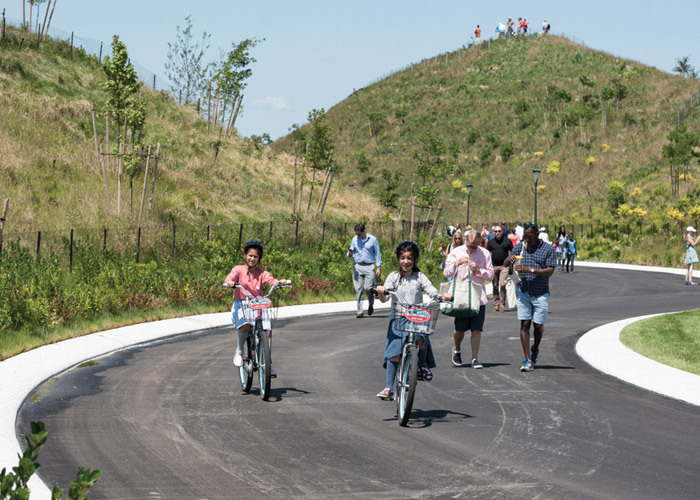 Where, huge infrastructure projects were once the fashion, now strategies are more nuanced, with shorter- to medium-term solutions often favoured these days. Says Bliek: ‘If you look at waterfront developments, planning ahead for more than 50 years is not so relevant. 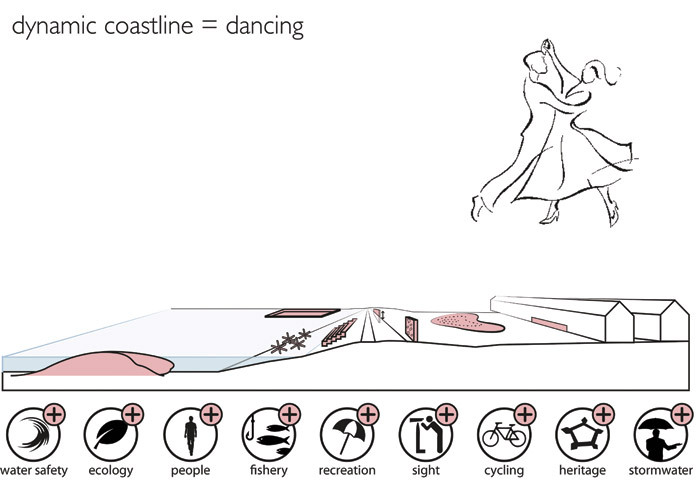 Plans have changed and ideas are different from what we have now.’ A case in point is Svašek’s recent coastal engineering scheme for the Dutch seaside town of Cadzand- Bad, where, instead of simply reinforcing or replacing concrete dikes and infrastructure from the Sixties, the town’s sea defences were dovetailed with investment in landscaping and public space, with a new stretch of protective sand dune and the construction of a new marina. At the forefront of these more nuanced and multifaceted schemes is New York- and Rotterdam-based landscape architecture consultancy, West 8. 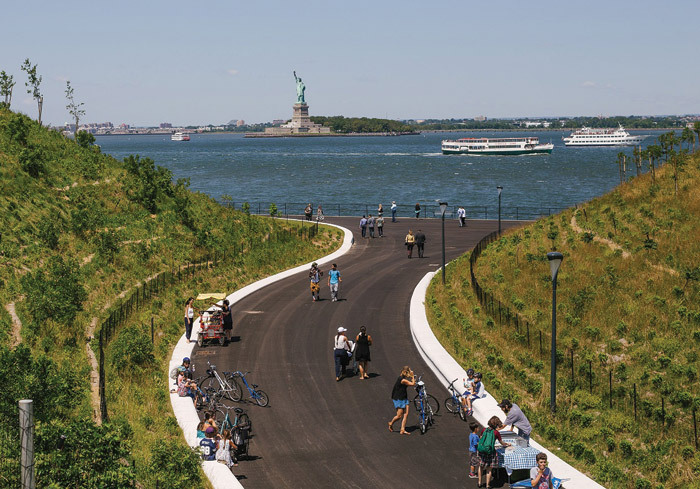 Director Adriaan Geuze and his practice seem to be involved in many of the world’s most significant waterfront projects, from New York’s Governors Island to St Petersburg’s New Holland Island. Over many years working with the leading engineers in this field, Geuze has combined his knowledge of engineering (both his father and grandfather were engineers) and his passion for natural and social landscapes to pioneer an approach that, wherever possible, turns the business of hard infrastructure into something that also benefits civilians. 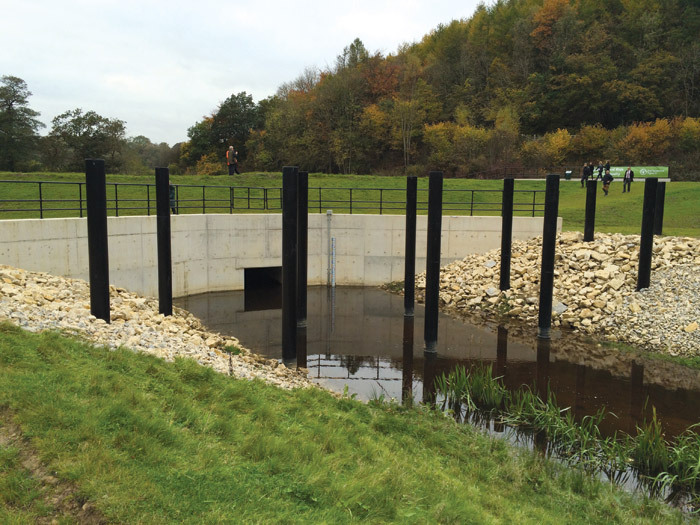 Another recent scheme, in the Biesboch area, to alleviate the threat of catastrophic flooding, saw off an initial proposal to carve out a major river bypass, even though such extreme flooding was only likely to arise once every 30 years. Instead, the Dutch River Program for climate adaptation suggested something far less severe and costly. West 8 participated in this large-scale landscape design. Says Geuze: ‘Our design proposed to leave agricultural land as it is, but put in a series of internal dike systems, allowing for at least three or four types of flood levels — once a year, twice a year, and every ten years. We are anticipating that there is not one flood problem but a diverse spectrum of flood levels that all might be dealt with differently. The farmers can have cattle in lower areas, which might be regularly flooded once or twice a year — in which case they move their cattle — while other areas can be perfectly usable every day. But if there is catastrophic flooding once in 30 years, the farmers will be compensated. It’s cheaper to allow the flooding and to compensate one season of livestock than it is to secure the land so it will never flood, which would mean that maybe one third of the entire area cannot be used for agriculture any more and will be used only for flood and water control. Geuze is not an evangelist for the softer, ‘let nature rule’ approach nor dismissive of the more traditional hard engineering approach — as a Dutchman, he points out, he cannot afford to be. ‘You might say civilization in Japan and Holland, and several other countries, was built there against nature… I strongly believe in clever engineering. My generation, when we started to design in the Eighties, we saw that these investments in infrastructural engineering or flood control for all kinds of conflicts caused by nature could also be beneficial. But if you make a concrete wall, you can make an earth wall. If you make an earth wall, you can plant trees on it. If it’s 10 feet [3m] wide, a path can be integrated into it. In the Sixties you would have had a concrete barrier or wall and that’s it. 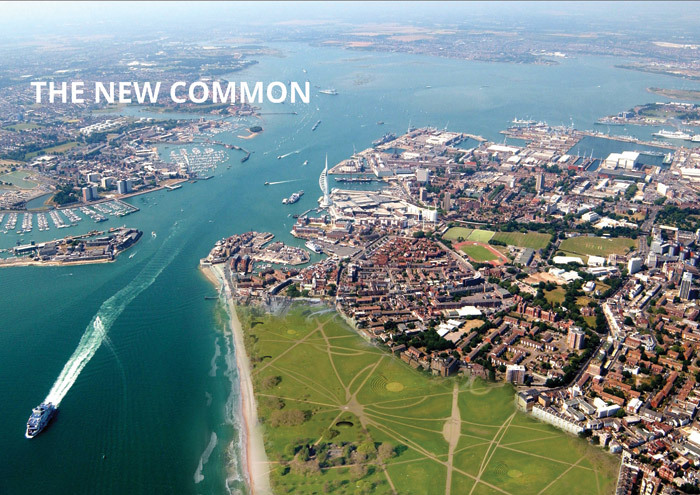 Now the outcome can be a landscaped space with biodiversity, seasonality, a place which people identify with, and which people can use. Maybe it is parasiting on the investment of the engineer, but why should we only give these projects to engineers who act like plumbers? They should also be given to artists, to designers, landscapers and children. These projects can contain many layers; there is always an option for a second agenda. 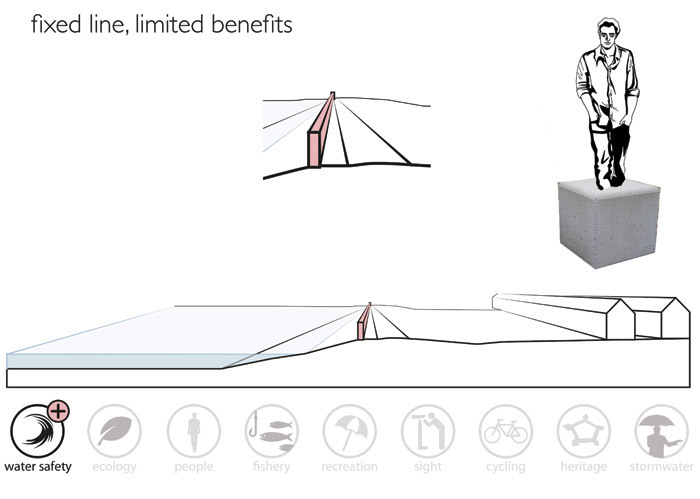 We ask: could an engineering solution be made with a softer approach or participatory approach? And often the answer is yes.’ In developing countries, the current pragmatism is edged with a hard dose of realism. With little or no cash for major infrastructure, a different kind of resilience is called for, according to Bliek. In Bangladesh, for example — where around 8 million people are deemed vulnerable to severe flooding, due to cyclonic storm surges — Svašek is combining meteorological intelligence with that other great technological leap forward of the 21st century — the worldwide uptake of mobile technologies — as well as architecture to help protect lives. The World Bank’s $400m coastal-defence programme for the region entails the rehabilitation of over 600km of embankments in 17 polders (areas reclaimed from the sea) in six coastal districts to provide protection to 760,000 people living within the polder boundaries. This initiative will see more land reclaimed from the sea for farming, in a further bid to reduce poverty and improve food security. But, as Bliek notes, these newly minted fields and their farmers bring even more people into the flooding risk zone. This means that the provision of enough cyclone shelters to house the local population — and keep their food stocks dry — is crucial. Hand in hand with the building of new shelters is a robust form of communication, to alert people to when the storms are about to hit. Says Bliek: ‘We are working on early warning systems. 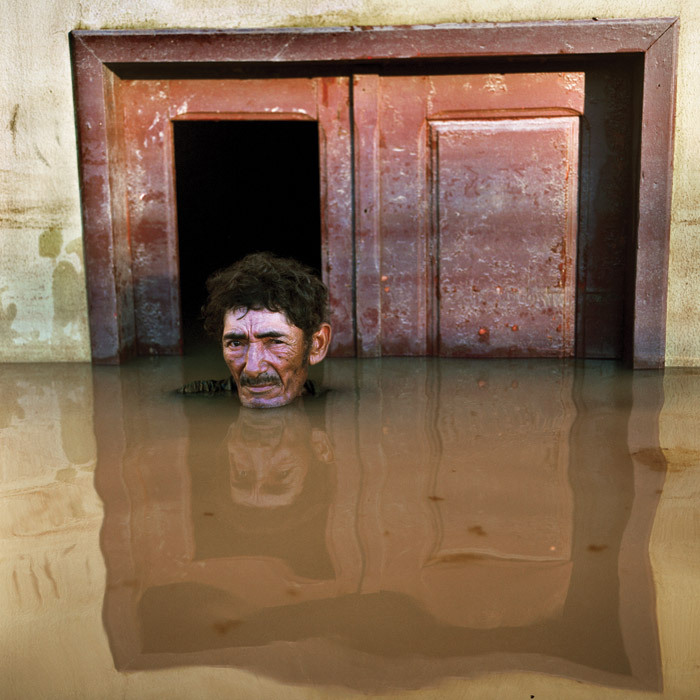 Though it seems initially harsh — even shocking — to have to accept flooding as inevitable in parts of the world where there just isn’t the funding to do otherwise, it’s perhaps a mark of this sector’s maturity that experts are realising human resilience is one of their strongest assets in a crisis – although it, too, needs to be channelled and supported with the right tools. Nowhere is this more visible than in New Orleans, where the horrors of Hurricane Katrina have left a legacy that is surprisingly positive. 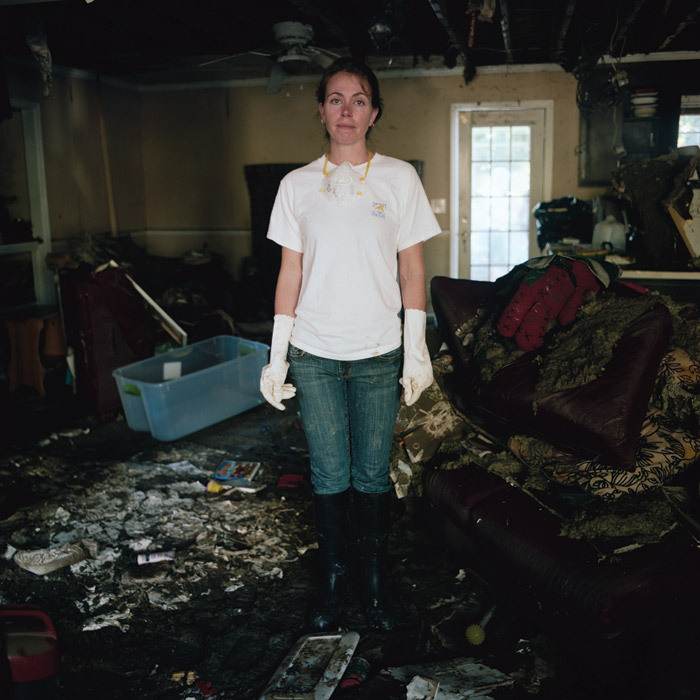 Marcella Del Signore, professor of practice at Tulane school of Architecture, together with her colleagues and students, have been working alongside local and national government agencies, experts and advisors, over the last 12 years, as the city has sought to recover from the 2005 Hurricane; one of the five worst natural disasters in the history of the US, it caused the death of 1,245 people and an estimated $108bn of property damage. Infrastructural investment has focused, she says, on ‘how the city builds with water,’ not against it. The parts of the waterfront that had been hard landscaping are being softened – for example, a formerly industrial area, along the Mississippi, has now become a major public park. ‘The transition time has seen the city build in a much more porous way as a whole,’ she says. But what has been fascinating to observe is how the city’s population has changed. 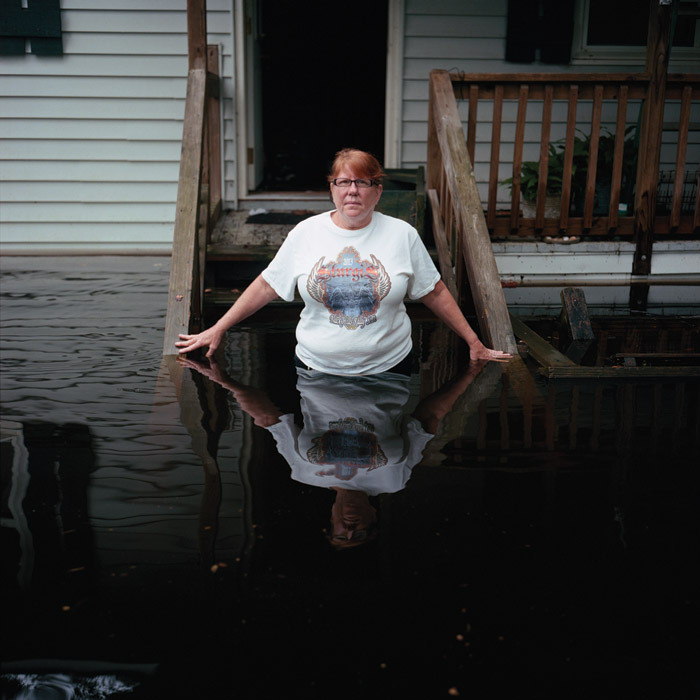 Many that left during or after the flooding have not returned. ‘The people who stayed here in New Orleans are very attached to the city. And a lot of the people that came after Katrina to help have decided to stay here. So we now have a city with a very different culture.’ Greater commitment, vision and enterprise characterise the new citizens, with start-ups establishing a wealth of new technology and creative businesses. ‘A lot of these people that arrived from other parts of the US are between 25 and 45 years old, and it’s really changed the social demographics,’ she says. Urban farms, social enterprises, new commercial spaces and restaurants have thrived. Experimentation and adaptation lead to a much more resilient, connective culture. Having weathered the storms, ‘the city is much more open,’ she says. Flooding is clearly a phenomenon few of us will escape in the future. But with the right technologies, the right methodologies from environment agencies, and the right attitudes, we may well come to see floods as survivable disasters, not catastrophes. Have we seen the end of huge, defensive infrastructure projects? They are certainly on the wane. Floating housing developments, the first examples of which are already bobbing about in Amsterdam and Rotterdam, are not for everyone.